JOIN THE "A" TEAM. TEAM APPLE. WE'RE LOOKING FOR A FEW GOOD RN's. The patient ALWAYS has the right to make an independent decision as to the desired provider for home healthcare services. Is Home Healthcare Right For You? 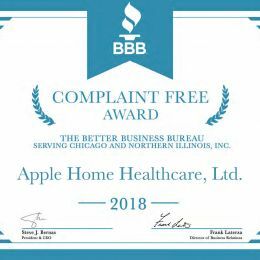 Apple Home Healthcare is an industry leader; we have partnered with Chicago area hospitals, physician groups, and geriatric care facilities to deliver full spectrum healthcare. For over 20 years, we have provided skilled medical care to help our patients recover after surgery or an acute diagnosis comfortably in their home. Our services, which include skilled nursing, physical therapy, occupational therapy, and speech therapy, are rendered in lieu of hospitalization, confinement in an extended care facility, or going outside of the home for the service. In fact, our top priority is to make your recovery as comfortable as possible and keep you from being readmitted to the hospital. If you are a prospective patient or a physician looking for a reliable home care agency, Apple is your best choice. We have the most compassionate, dependable, and expert staff that will help you navigate through your medical recovery needs. Contact us today to see how we can help you recover with a personalized recovery plan. The numbers don’t lie. Apple’s proven record is reflected in our longevity in the field of home healthcare, outcomes, and patient satisfaction rates. The number of medical Professionals who have referred to Apple. The number of patients we have treated since 1993. The percentage of patients who would recommend Apple. The number of zip codes that we have serviced. Get the latest Apple Home Healthcare Company headlines, updates & more from our intuitive newsroom manager Newton. Becoming an Accredited Business with the Better Business Bureau is an honor not accorded to all businesses; because not all businesses meet eligibility standards. Apple’s proven record is reflected in our longevity Our excellence can best be demonstrated by our patient, employee and client testimonials, which regularly recognize the competency of our clinicians and staff and their commitment to patient care. “Approximately a month ago, I was discharged from Northwestern Memorial Hospital where I had been treated for Congestive Heart Failure. My doctors highly recommended that I needed a home health nurse. I was very skeptical of the idea as I had several in the past that I did not like and had ended the relationship before the program was finished. “I am a 76 year-old woman and had my right hip replaced one year ago. This year I had to have a full left knee replacement. Needless to say I was not looking forward to my rehab. However, I was very fortunate to have my therapist. There is no comparison to the treatment I had a year go for my hip to my Apple therapist’s treatment for my knee. 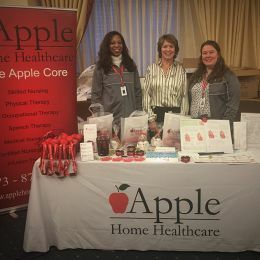 Ready to learn about Apple Home Healthcare?